Moses spends so much time with God that his face glows (Ex. 34:29-35). If there was ever a time when someone became a “friend of God” (thanks to Israel Houghton for the image), it had to have been Moses. Sure, David will earn “man after God’s own heart” status, but here’s Moses looking like the candidate to co-star in the buddy cop movie with YHWH. Or is it the song-and-dance number with the big finale with spirit hands? I have a hard time imagining that level of friendship with the God of the universe. But that’s what God implies we should have in the relationship with Jesus. Yet, in the Old Testament, it seems that the devout, the faithful, etc. can have that kind of friendship with God, where they finish each other’s sentences, know what the other needs, and know how to push the other’s buttons. After wading through the explanation of how to prepare the tabernacle and the implication that Moses was shown pictures (on the side of the mountain? in his mind?) of what it would all look like, and after Aaron was given the weight of being the priest even though he would blow it mere hours later, we see Moses spending even more serious time with God. We get the first historical notation of a sin offering (Exodus 29:14). We get Moses nearly blowing his top at his own brother over the golden calf (Exodus 32:1-8). We get Moses serving as the advocate for the people that he’s angry with to save them from God’s wrath (Exodus 32:11-14). We get Moses seeing the glory of God (kind of) when God passes through when they’re on Mount Sinai together (Exodus 33:19-23). 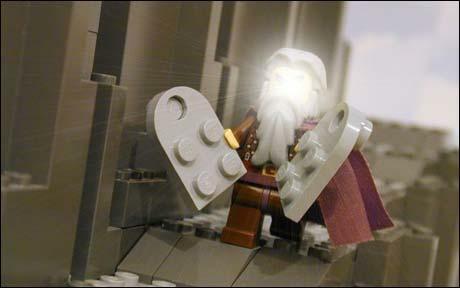 But then Moses starts glowing like he’s irradiated in Exodus 34:29-35. He glows like a superhero! The people are so terrified him that he had to put a veil over his face when he was around other people. Being in the presence of God fundamentally changed Moses. I wonder what fundamentally changes me… Gatorade? This level of relationship with God is pretty mind-blowing. So, here’s my big takeaway from this one: Moses is with God and he’s forever changed. Moses wants to be with God and so everything changes. I want to be with God, but am I with God so much that other people see a change in me? Do I let God shine through me? What would it take for you to glow? This entry was posted in Bible Says What, Books, Theology and tagged friends, God, God's glory, Moses, veil. Bookmark the permalink.